Tonight, the city council will consider the approval of Stockton’s first major residential development since the recession ended. The proposal, dubbed Bear Creek East (BCE), would add about 2,000 homes—most of them single family– within a 160 acre swath of farmland just south of Eight Mile Road and east of West Lane. In December, the city Planning Commission voted against the project in a 4 to 3 vote, but that decision is non-binding, and the city council could ultimately approve BCE despite the Planning Commission’s vote. With the housing market finally recovering, some may rush to the conclusion that the city must start building homes once again. The Building Industry Association’s John Beckman has said that Stockton should approve this plan or risk missing out on the next “housing boom.” But it’s this kind of reckless, build-at-all-costs mentality that led Stockton into a foreclosure crisis in the first place, and before the council starts approving greenfield projects, it’s imperative that they make sure that any new projects will actually benefit Stockton. 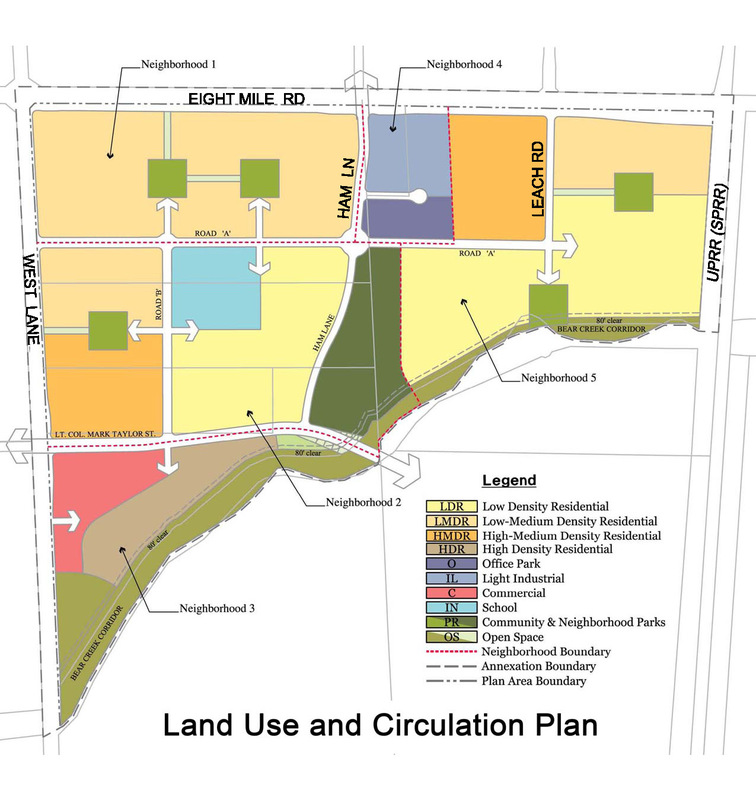 When the city planning commission voted down BCE, some referred to the proposal as “leap frog development,” a term referring to greenfield, noncontiguous construction on a city’s outskirts. BCE easily fits this description given that there are no existing adjacent neighborhoods and the project site is currently used for farming (as you can see from the accompanying picture). Nevertheless, the project’s backers think differently, here’s an excerpt from the commission denial appeal. This claim is laughable at best, disingenuous at worst. If you read the appeal, BCE’s developers try to sell their project as “infill” on the basis that one day, there might be homes built around BCE. There are two problems with this interpretation of “smart growth” and “infill.” First, there are absolutely no tenants of new urbanism—an emerging division of urban planning which the developers claim to adhere to– where building homes on farmland can be considered “infill.” True infill occurs when a project site is already surrounded by existing development where roads, sewers, sidewalks, etc can be leveraged. Second, BCE doesn’t get points for infill just because there may be future adjacent development where there is none today. Imagine if the group that built Lincoln Village classified their project as “infill” on the notion that one day the city would catch up to them. That would have been a preposterous claim, but it’s the same one BCE is making. BCE’s developers go on to say that their parcel of land has been in the city’s “sphere of influence” since 1990, so they should be allowed to build. This is an equally disingenuous claim, as neither the sphere of influence nor the general plan promise development rights; they are simply planning documents. Another point of contention during the Planning Commission meeting in December was that the city has already approved close to 44,000 homes along the city’s edges (the vast majority of them single family homes), and therefore, BCE is not needed. This is an important point. Before the recession, the city approved essentially every proposed development. 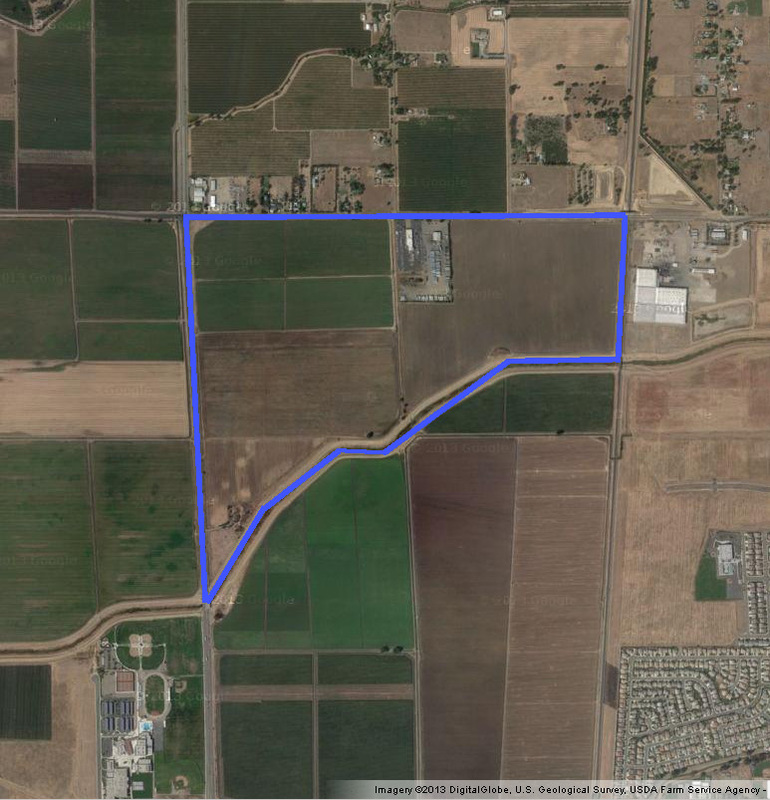 As a result, there are several projects that have the green light whenever they decide to start building again, with a majority of these “paper lots” approved for northwest Stockton. There are several design elements in BCE that would actually encourage walking and biking to a certain extent, something the project’s developers are quick to tout. But these elements are dwarfed by the amount of driving residents will need to do to get in to Stockton to conduct their daily errands. Unless a resident has the great luck of having their job, bank, doctor and favorite food joint located in BCE’s small commercial component, most residents will still need to drive in to Stockton (or Lodi) for most things, like seeing a movie, attending classes at Delta or going to a department store. The average household in Stockton’s northern reaches emits nearly twice as much pollution than households in more central neighborhoods, and mostly because of increased transportation emissions. More subdivisions on the periphery will create more high-polluting households. Moreover, the city is developing a Climate Action Plan with serious emission reduction goals, but projects like BCE will greatly diminish these efforts. Based on the project’s specific plan, BCE will require 10 new officers, the cost of which must be borne by the city. In the city’s current state, it’s hard to justify diverting police resources to a shiny new development when there are very real problems within city limits that demand the majority of the police force’s attention. With the police department just getting a handle on crime, diverting resources to patrol and protect new, outlying areas of Stockton could diminish gains made in public safety. In essence, the residents of existing neighborhoods would be subsidizing police protection for brand new ones. For all of these reasons, I hope the city council will decide that BCE is not right for Stockton. But BCE is not entirely bad, and I’ll give credit where credit is due. I won’t go as far to say that BCE is “wonderfully, deliciously designed” as Planning Commissioner Steve Chase has said in the past, but BCE does have some design elements suggesting that developers are responding to changing consumer preferences. The project appears to include protected bike lanes, higher density levels, commercial buildings fronting their adjacent streets, and a street-grid design that would foster greater connectivity. BCE’s documents also state that the developers would be willing to contribute to a downtown fund, within reason. However these bells and whistles do not diminish the fact that this development is on open farmland outside of the city limits. With so many other greenfield homes already approved, it simply doesn’t make sense to reopen the spigot of subdivision building that helped bring the city into bankruptcy in the first place. The Bear Creek East Project is such a lackluster misuse of virgin agricultural land that it is utterly egregious. It lacks “high intensity” attributes. 2000 more homes of sprawl in a city without more sustainable employers, and in a city with a glut of blocks and blocks of empty abandoned homes, and acres of new greenfield homes already approved. Now that makes a lot of sense. And equally egregious is the handing over of this large swath of the Eight Mile Road Corridor, this major east-west artery that could be a splendid “Northgate” to Stockton, to be instead lined by, of all things, “Low-Medium Density Residential” — TRANSLATION: tacky mundane track homes, condos and apartments. You can’t get more absolutely dismal and visionless than that. This vital and major boulevard and its adjacent property should be earmarked for 100% public access, featuring along its north and south sides major tax revenue generating amenities for the city and feature amenities that all its citizens may have access. The San Joaquin County leaders and Stockton municipal leaders really need to take charge and muster up the backbone to initiate the POLITICAL WILL to precipitate to the forefront an “Eight Mile Road Corridor Strategic Vision Master Plan” that developers will be forced to oblige to its official design prerequisites established, so that the typical land misuse and ill-direction can be entirely avoided and a cohesive and comprehensive overall strategy be galvanized. In this way individual developers will fit their contribution project into the overall puzzle and design scheme with seamless continuity. And I’m not talking of the usual ordinary ideas of mere big box stores with acres and acres of asphalt parking, shopping malls, and mere retail, or even a generic office business park. There needs to be a quantum leap in brainstorming here, i.e. a major regional “HIGH-TECH CORRIDOR” or “AGRI-TECH CORRIDOR” or “BIOMEDICAL CORRIDOR” or a combination of the aforementioned, or something of equal magnitude, featuring new educational institutes, research labs, tech centers, IP (intellectual property) developers and drivers, and the support amenities, including high density residential as well as the hospitality and conference industries. This kind of strategy will generate a higher intensity local economy with over-spill to drive Downtown Stockton redevelopment into a new era of renaissance. Well said Jon and David! With California in a drought and having the responsibility of providing half the fruits, nuts, and vegetables throughout the US, do we really want to build on Farmland? Who will buy these new homes in Bear Creek? Are there new jobs coming to Stockton that we are not aware of? We have virtually no money for Police, Fire, and Public Works under our current Municipal financial conditions. It is a myth to believe developers pay the entire fare for these farmland developments. We, as taxpayers are the investors for this sprawl. It gives our struggling community a black eye and an F on our Planning report card. If we infill what is truly our city, we would have housing for the next 20 years, AND we would be providing jobs for building and trades for years to come.